At our recent AGM, the Sandyford Business District Association (SBDA) launched the campaign to establish a Business Improvement District (BID) in the Sandyford Business District (SBD) Area. We, the members of the campaign task force, believe that the businesses in the SBD Area need to come together and work with each other to strengthen what our District has to offer. A BID is a defined area within which businesses pay a small contribution in order to fund projects within the BID’s boundaries. A BID is business-led and provides you with the opportunity to have your say on the delivery of projects that will make a tangible difference to your business. The BID model makes sure that everybody contributes to the governance and vision of our district. BIDs are business-led and provide you with the opportunity to have your say on the delivery of projects that will make a tangible difference to your business. Over the next 5 years, the Sandyford BID will bring in excess of €2.5 Million of additional investment – which will be provided through a sustainable business model run and governed by the businesses/stakeholders in the Sandyford BID area. 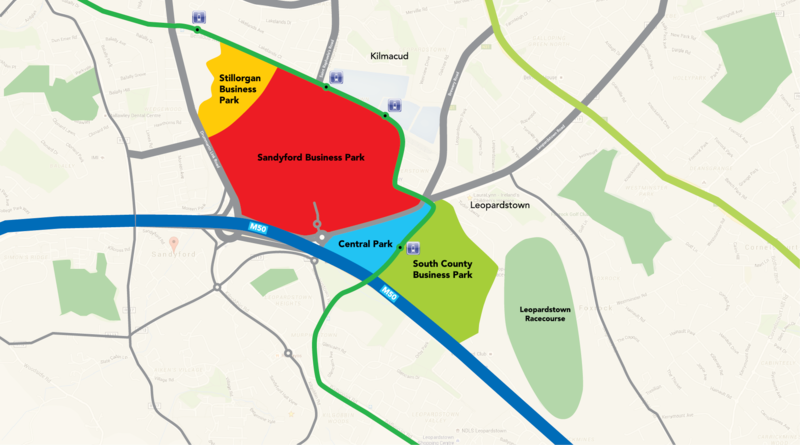 WHAT IS THE VISION OF THE SANDYFORD BID? a place where living, working, shopping and spending leisure time is attractive, easy and positive. Initiate ‘Place Branding’ Programme to include evolution of SBD identity and creation of marketing collateral. Generate new mapping of area based on “Tree” theme linked to road names. Promote SBD through SBD website optimisation, video & marketing material. Develop internal and external communications strategy. -Landscape and park enhancements, green areas. -New playgrounds and leisure areas. Invest in new Security Systems including CCTV and Registration Plate Recognition Technology. Enhance the connectivity with Dublin airport, Dún Laoghaire, North Co. Wicklow. Exhibitions to promote business clusters. Recognition & awards for excellence. Sporting Events e.g. Community 5k ‘Twilight’ Run. Pop-up Galleries in vacant buildings. More lunchtime and evening venues. Bing and Google-ise SBD (‘Google My Business’ etc). Invest in Smart District Technology (inc. Wifi & Broadband). Develop effective (digital) Communication Strategy. Provide businesses with the opportunity to participate in collaborative procurement and Cost Saving Initiatives / Green business initiatives. Investigate jointly procured services for trade waste, recycling, utility and insurance bills. Invest in staff retention programmes (discount schemes from SBD businesses). Create a ‘Privilege Card’ for all residents who can avail of special discounts from SBD retailers in particular. Communication re. availability of grant schemes. Show your support for SBID!